Following an early visit in May to a member’s land near Tidenham, Chris Parsons returned in early July with Viv Phillips. Despite heavy rain the owners showed us round the fields and garden where a rich array of wildflowers were on show. Situated close to the Wye Valley limestone gorge this land has a very lovely agriculturally unimproved, calcicolous flora. The present owners have lived here for 10 years and are keen both on gardening and maintaining the wild flowers and wildlife. Their predecessor also had the same interests so the land has a long history of unintensive management. The grassland is made up of four different areas, totalling about 4 acres. Although all the areas have a limestone flora, they are all subtly different as a result of varying soil depth, history of disturbance and management. Area A. A small area of dry calcareous grassland running along the drive with a hedge on the north side. 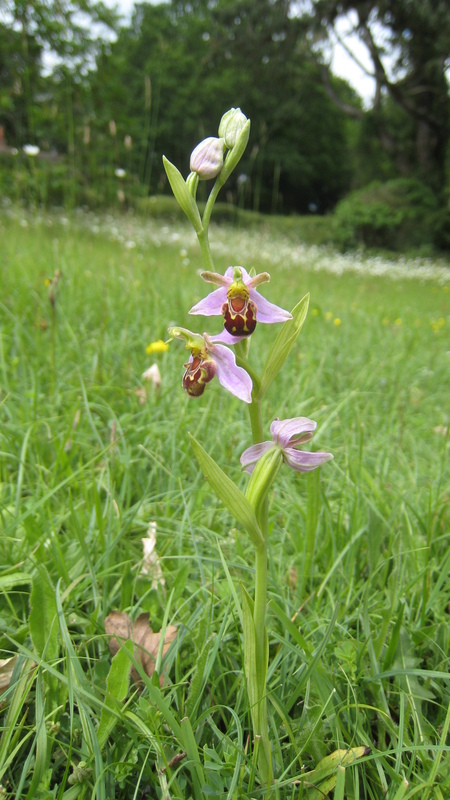 This is a very attractive patch of dry grassland where several Bee orchids have appeared in 2012 for the first time. In May there were at least 50 Green winged orchids here and later each year there are Autumn Ladies Tresses. In addition to these rarities there were many other wildflowers and quite limited grass growth which was almost entirely made up of the finer native species including Quaking grass. This grassland is cut in late summer after the Autumn ladies tresses have finished. This allows seeding of most species to take place. Area B. A one acre meadow which is south-sloping with tall, mature trees along the lower boundary. Much of the growth was long and the grasses are vigorous though still comprising mainly the finer species. A disturbed area had been wild flower seeded but this was blending in with the untouched flora and a good number of species were seen including Common Spotted orchid, Sorrel and Salad Burnet. The lower slopes are shaded by the tall trees to the south and the grass is lush with invading bramble and some self set willows. Bracken is also present but only in thin patches. The main management issue is that currently mowing without removing the cut material is resulting in a thick suppressing mulch. Over time this will favour coarse grasses against the less competitive wildflowers. It is a difficult site to graze though this would certainly help if achievable. The principle advice is to cut some time after mid-July and to take off the cut material. CP suggested that the cut material would be possible to make into excellent compost/soil improver if a small area was set aside for this on the field/garden boundary. Area C. Lawns in front of the house falling in terraces and becoming less formal as they descend. The lawns in front of the house are delightful as they are clearly unimproved limestone grassland full of nice species which are minaturised in the top lawns where cutting is more frequent. 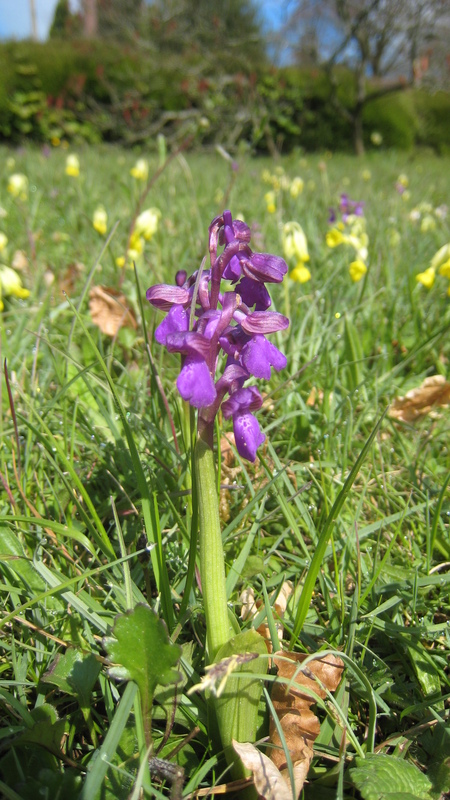 In May about 30 green winged orchids were seen. Frequent cutting is needed on the top lawn to create the contrast to the luxuriant garden borders but it is done sympathetically , only every 2 or 3 weeks with the cutter raised several centimetres. The result in June was a carpet of delicate Mouse ear hawkweed and Self heal flowers. The lower lawns have neat paths cut around and through them letting the rest flower. Many species are present including at least 10 Twayblades, a fairly uncommon orchid. Area D is another species rich meadow sloping south and west. It has a wide range of the species seen in A-C . There were areas of numerous flowering Common Spotted orchids, though no other orchids were noted. Slender St John’s wort was added to the species list and Pignut and Lady’s smock were here in May. Also interestingly Yellow rattle is here but not seen in the other areas. The field varies in the density of its grasses being most lush in the lower shadier areas. This field is managed like area B and it too will benefit from cutting with the cuttings removed if this can be arranged. The yellow rattle is present in fairly small amounts at present but if allowed to set seed each year it is likely to spread and to help reduce grass vigour by its semi-parasitic behaviour. Overall the whole site has a wide range of valuable habitats because there is so much variety in both habitat structure and species . Above all the quality of the grassland is very high with a range of species including many calcicolous specialists and several rare species. A post-mid-July grass cut incorporating removal of the cut material is recommended for all areas each year. Finding a contractor able to bale hay or forage harvest the fields is a problem but the DMG website has a contractor’s list which may help. Compost making may provide part of the solution and the yellow rattle in field D will certainly help to lower fertility over time, to benefit the other more desirable species.